This short article introduces a longer one by Dr. Rabah Saoud on the life and works of the Turkish famous architect of the 16th century; the full article is available here as 15 page PDF file. Mimār Koca Sinān, the "Great Architect Sinān", was born in Anatolia, Turkey in 1489; he died in Istanbul in 1588. Generally considered the greatest of all Ottoman architects, his career spanned about 50 years since he was appointed chief royal architect to the Ottoman court by Sultan Suleyman I in 1539. His buildings, mainly his great mosques, are the archetypal image of Turkish Ottoman architecture. During his long career Sinān built hundreds of buildings including mosques, palaces, chapels, tombs, schools, almshouses, schools, caravan serais, granaries, fountains, aqueducts and hospitals. Of this diverse group of works, his mosques have been most influential. In his mosques' design, Sinān exerted his inventive experimentation with centralized domed spaces, often compared with parallel developments in Renaissance Italy. Further, he produced monuments in which the central dome appearted weightless and the interior surfaces bathed in light. He often designed his mosques as part of a complex comprising schools, baths, guesthouses and hospitals. The life story of Sinān is somewhat complex and full of uncertainties. The successful career of this great architect and his genius have prompted great interest among historians of architecture and of Islamic civilisation in the Ottoman period. Some of these scholars constructed his life story linking it very much to his Christian origin. As narrated in these sources, his parents are of Christian origins, his father being a stonemason and a carpenter from Greece, or Serbia, or may be Austria. According to these sources, Sinān learnt his father's trade at his youth but he was snatched from his family and taken to work for the Caliph court. With the skills learnt at an early age, he quickly developed his career of architect from his military service at the Janissary Corps. To bring a balanced approach to the real life of this astonishing personality, one has to dig into Turkish sources which consist mainly of his personal biography written by his friend of youth Sai Mustafa Celebi in three texts: Tezkiret ül Bünyan, Tezkiret ül Ebniye and Tuhfet ül Mimarin. These valuable documents were published by Apdullah Kuran in 1987 (see bibliography). An important source also (the entry on "Sinān" by Dogan Kuban in a recent collective work of a team of Turkish academics, The Great Ottoman Turkish Civilisation, 2000) sheds some light on Sinān's biography. On the basis of the results of this extended scholarship, we gain a more accurante picture on the circumstances that surrouded the life of our great architect. Sometimes in 15th century Ottoman Caliphate, a Greek Christian embraced Islam and became known as ‘Abd al-Mannān, the servant of the Bestower. According to Tezkiret ül Bünyan, ‘Abd al-Mannān chose this name in praise of God who made him a Muslim. He was a stonemason and a carpenter living at Kaysari, central Anatolia. On April 15, 1489 ‘Abd al-Mannān was granted a baby son whom he called Sinān. Figure 1. Gülru Necipoglu, The Age of Sinan: Architectural Culture in the Ottoman Empire (Princeton University Press, 2005). An historical and sociological tour de force, an authority in the study of Sinān and of Islamic art and architecture. From an early age, Sinān followed his father footsteps and learnt the skills of his trade. When he reached 21 years of age, he was recruited by the Devshirme into the Janissary Corps within the reign of Sultan Selim I (1512-20). When he was a conscript (acemioglan), Sinān mentioned that he was willing to learn carpentry. Kuban suggested that Sinān built ships, wooden bridges and probably all sorts of temporary wooden constructions. These skills were further developed during his military service as he participated in a number of Ottoman campaigns including Belgrade (1521), Vienna (1529) and as far as Baghdad (1535). He distinguished himself, particularly, in the campaigns of Belgrade and Rhodes (1522), showing bravery and steadfastness that he was promoted to "zenberekdji bashi", a chief firework operator. In 1534, Sinān participated in the Persian war and showed great effective skills in the battle of Lake Van when he devised ferries for the crossing of the army through the lake. In another campaign, at Wallachia (now Romania), Sinān built a bridge across the Danube for the crossing of the army. This brought him fame and admiration, promoting him to the chief of military constructions and expanding his carpentry skills to masonry. He gained great experience from this having the opportunity to build or repair bridges, defences and castles. Since then, his talent attracted the Ottoman Sultans who took him as their chief architect for the construction of mosques, schools and other civic buildings. The training Sinān had in the Janissary Corps and the contact he made with a wide range of architectural experiences broadened his vision and developed his skills. His travels with the army through a vast geographical region extending along the Mediterranean Basin from Anatolia to Italy and the Adriatic coast to Central Europe, and from Azerbijan to Baghdad in Asia enriched his architectural knowledge and provided him with a wealth of ideas, resources and solutions. The synthesis of this knowledge was reflected in his famous constructions as seen in his chief work the Suleymaniyye Mosque (1550-1557). Figure 2. 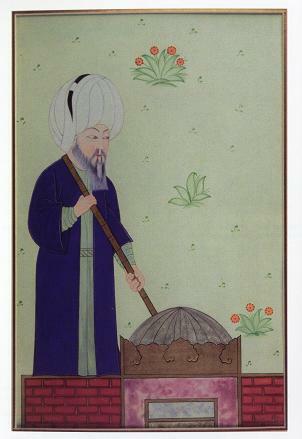 Sinan depicted preparing the grave of Suleyman the Magnificent by Nakkash Osman. Repainted by Ilhan Goksen. Kayseri Selcuklu-Osmanli Mimarisi ve Bezemeleri, Ord. Prof. Dr. A. Süheyl Ünver Nakishanesi Yorumuyla, (ed. by. Nil Sari and others). Kayseri, 2006. Sinān's biographer Sai Mustafa Celebi, who was his friend, counted some 343 buildings as shown in the table below. However, the three sources mentionned above (Tezkiret ül Bünyan, Tezkiret ül Ebniye, Tuhfet ül Mimarin) together listed a staggering total of 477 buildings. In geographical terms his work stretched over most of the regions of the Ottoman Caliphate including, for example, the Mosque of Khorsaw Pasha in Aleppo, the Mosque of Sultan Suleyman in Damascus, the dome of the sanctuary of Al-Haram Al-Shareef in al-Quds and the school of Sultan Suleyman in Makkah, Mosque of Mehmed Pasha in Sofia and in Herzegovina, Mosque of Mustapha Pasha in Ofen (Budapest), and the Palace of Mehmed Pasha in Sarajevo. As established in the article "Sinān" in the Encyclopaedia of Islam (first edition, Leiden, 1934, p. 428), the legacy of Sinān amounts to about 330 buildings, including mosques (jāmi' and masjid), schools (general schools or madrasa as well as Quranic schools), palaces, baths, mausoleums, public kitchens, rest houses or caravansaries, bridges, aqueducts, hospitals and store houses (makhzan). For an accurate evaluation of Sinān's architectural contribution, the reader is advised to consult the bibliography below and in particular the valuable publication of the Journal of the Islamic Environmental Design Research Centre and the authoritative book published by Gülru Necipoglu, The Age of Sinan: Architectural Culture in the Ottoman Empire (Figure 1). Sinān has been compared to Michelangelo of the European Renaissance that was nicknamed Michelangelo of the Ottomans. His works in Suleymaniya Mosque (1550-56) at Istanbul and Selimye Mosque (1551-74) at Edirne are the finest and often compared to Renaissance works of Florence, especially those of Alberti (1404- 1472). Kostof extended this comparison to Renaissance Venice.